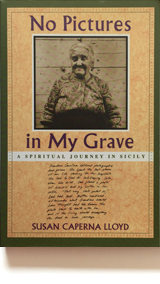 The story of a woman’s journey to self-realization by means of the rituals and legends of Sicily. Lloyd travels to the spiritual landmarks of Sicily — primitive cave drawings of fertility goddesses, the Madonna Nera of Tindari, and sanctuaries and temples dedicated to Demeter — searching for the secrets of these powerful female symbols. As she journeys alone into the heart of Sicily, tensions between this quest for feminine strength and historical validation and the male-dominated society escalate. As Lloyd conquers her fears, she successfully navigates through the strict cultural mores of a patriarchal society. In a climactic ending, she returns to the Procession of the Mysteries armed with inner strength and power. Susan Caperna Lloyd's other work includes two documentary films: the award-winning Processione: A Sicilian Easter, about the Procession of the Mysteries of Trapani, and Between Two Worlds: A Japanese Pilgrimage, concerning a Buddhist pilgrimage on the Japanese island of Shikoku. Lloyd lives in Jacksonville, Oregon, with her husband and two sons.